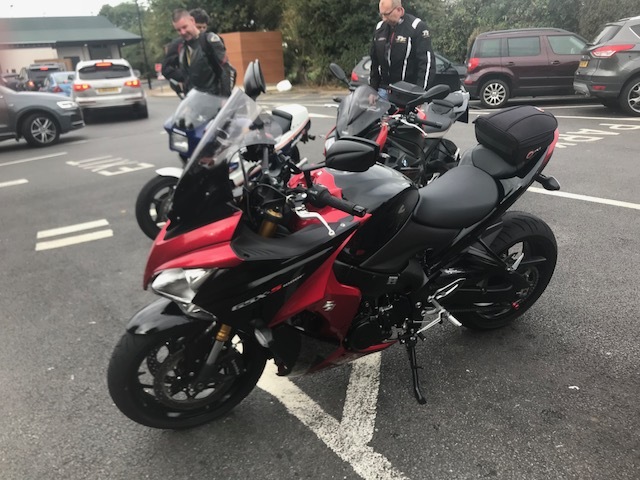 Went into London yesterday for a bike meet , spent much of the ride on the way down (from the midlands) on my friends GSX1000 while he rode my BMW. Im not overly keen on the looks of the Suzuki but that large fairing(and screen my friend has fitted) work brilliantly, the seat is lower, so you really feel you sit "in" the bike and are well protected from the elements, it was a bit blowy on occasions but the bikes stability was excellent, with my MRA screen, anything past 120-130 on my S1000 induces some bar oscillation and after 140, the aeros are bad enough to induce double vision...with the stock screen its fine however. I took the GSX up to past 140 no problem , totally stable and a nice place to be, it has a touch more legroom as well , along with slightly higher bars, id say over distance, it could well be a more comfortable bike for most, agreed im not exactly comparing eggs with eggs as the naked version will have a lower bars and the lack of screen/fairing of course but its a roomy riding position for sure. The brakes where not as good regards initial bite and power as the BMWs but so my friend says, thats easilly rectified with a change of brake pad, the handling was the biggest difference between the 2 bikes, the BMW is much taughter, more sportsbike like , changes direction easier , on occasion when hitting a bump at speed or putting some power down exiting a corner, the Suzuki would wallow and bounce a little but it was still manageable and very easy to manage. The solid and easy to use Suzuki switchgear highlighted again how poor the BMWs looks and feels in operation. Power wise, my friends GSX still has the stock end can but he has Arrow headers fitted and its been mapped to suit, with IIRC 152BHP at the wheel, it certainly shifts but it is nowhere near as smooth at any throttle opening like the BMW, which that and the brakes where the biggest differences my friend noticed between the 2 bikes. When you think the motor dates back to the 2005 GSXR, its doing very well! Gearbox was the usual Suzuki delight and as much as I enjoy my quickshifter ,it isnt as positive on the downshift as the upshift so I can take or leave it TBH. Overall, I was surprised how much I liked the Suzuki, not as much as the S1000 as its more focused with more kit( im loving the cruise and heated grips as much as the motor/brakes now !) but the Suzuki is £10,300 (and the naked version cheaper still) and currently on a 2% finance deal, its extremely good value for money. My brother-in-law has a GSX1000S and I thought that was OK too. I didn’t really try to push it (we were riding abroad, so not the place to have a moment on someone else’s bike) but I liked it at, say, 7-8/10ths pace. Brakes weren’t as good as the BM as you say. I didn’t like the tall gearing, you could do pretty much everything on the road in 3rd alone and I like to go up and down the box the old fashioned way. I also didn’t find the GSX’s power deficit made any significant difference on the road when we were riding our own bikes. I wouldn’t swap my R for the GSX (just my opinion).